Formulated without soap and with a botanical-origin cleansing base made from a Coconut derivative, it cleanses the body with infinite gentleness. Its gel texture transforms into a delicious foam on contact with water. The Nuxe touch: A fine and delicate soap-free foam. Formulated without paraben. 88% ingredients of natural origin. 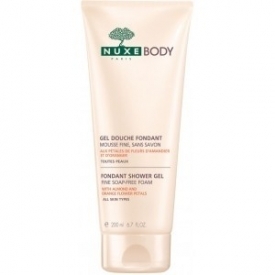 "This shower gel from Nuxe is truly delicious! It is stated that when the gel comes into contact with water, it turns into a creamy..."